“Today, cyber bullying doesn’t just involve teens but anyone can be attacked – on Facebook, email, or by texting. 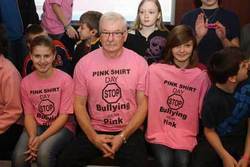 Bullying can lead to depression, not wanting to go to work or school, long-term effects that stay into adulthood, or to suicide.” This is the introduction leading up to the Wetaskiwin and Area Pink Shirt Day on February 27, 2013. The kick-off to Pink Shirt Day was held in the Griffiths Scott Middle School in Millet on January 21st. Students and staff gathered in the lobby and were advised how to detect and avoid bullying and told about the harmful effects of bullying. In December of 2011, the Pink Shirt Day Coalition was formed in Wetaskiwin. As plans for Pink Shirt Day 2012 evolved, the Coalition decided the Pink Shirt Day would be the best way to spread the anti-bullying message; that bullying would not be tolerated in our community schools, our playgrounds, our businesses, our homes or on our streets. Still, on Pink Shirt Day, February 29, 2012 more than 750 supporters throughout Wetaskiwin and region adorned pink t-shirts. The t-shirts were a symbolic and visible method to take a year-round stand against bullying in this community. Interested schools, businesses, organizations and individuals were challenged to show their support for taking a stand against bullying by purchasing and wearing the pink, $10.00 T-shirts. The response was overwhelming. The first shipment sold out very quickly. A second order was placed and almost every one of the 784 t-shirts that were ordered, were sold. In the fall of 2007, two young men, David Shephard and Travis Price, became aware of a grade 9 student at their Nova Scotia High School who had been bullied for wearing a pink polo shirt to school. Instead of retaliating with violence, these remarkable young men went to their local dollar store and purchased 50 pink shirts and distributed them to their high school friends the next day to wear in a show of solidarity to the young man who was bullied. This simple act of kindness garnered the attention of many and Pink Shirt Day was born. Pink Shirt Day now takes place around the world and in every province in Canada and every state in the United Sates. Information and forms available on Pink Shirt website. Details about the local event can be found on the website www.pinkshirtwetaskiwin.com or www.pinkshirtmillet.com. The site is a useful resource tool for students, parents, teachers, seniors and employees/employers on workplace bullying. The website is set up to be interactive. It allows community members to take a stand against bullying in their communities by downloading and printing off a paper pledge form. Single or group photo’s, with the pledge form, can then be emailed off to be uploaded to the website, to promote workshops or courses on bullying on the website. Wetaskiwin and Area Pink Shirt Day Coalition members include the Wetaskiwin Regional Public Schools, HUB Mental Health Capacity Building Project, Wetaskiwin RCMP Detachment, City of Wetaskiwin, Town of Millet, Boys and Girls Club of Wetaskiwin, and the Peace Hills Lodge. If you are interested in taking part in the local area Pink Shirt Day and want to show your support you can register your name, business or school on the Facebook Page – Wetaskiwin Pink Shirt Day. T-shirts can be ordered from the Boys and Girls Club by calling Krystianna at 780-352-4643 ext.38 or Debbie at 780-352-4643 ext.32. The shirts are $10. each.